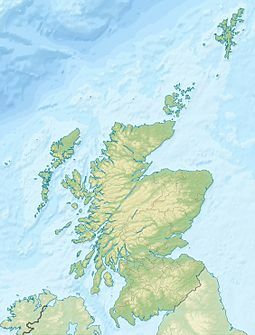 Not to be confused with Preston Island, in the Antarctic..
Preston Island is a former artificial island in the Firth of Forth, Scotland. The reclaimed land was once used for salt production, using local coal. It is part of Fife. Preston Island, south of Low Valleyfield in the Firth of Forth, was reclaimed by Sir Robert Preston in the early 19th century. A sea wall was constructed, followed by buildings and a coal mine, producing coal for the production of salt in saltpans on the island. Two further coal shafts were in development when a fatal firedamp explosion occurred in 1811, after which the mine was closed. Salt production continued for some decades, under lease from Preston. The buildings later housed an illicit distillery. Several well-maintained ruins remain. The 'island' is no longer surrounded by water, following further land reclamation, using ash from the nearby Longannet power station. ^ a b "Nature reserve on island". West Fife Villages. Retrieved 26 December 2009. ^ a b c "Preston Island". Gazetteer for Scotland. Retrieved 26 December 2009. ^ a b Ewart, Gordon; Stewart, David; Dunn, Andrew (1996). "Preston Island: archaeological research and excavations" (PDF). Tayside and Fife Archaeological Journal. 2: 1. ^ Cunningham, Andrew (1902). "Extracts from Romantic Culross, Torryburn, Carnock, Cairneyhill, Saline and Pitfirrane". Scottish Mining Website. Retrieved 23 May 2016. This page was last edited on 12 March 2019, at 18:31 (UTC).